Phone calls here in 2018 seem to be more and more rare, especially with younger people. 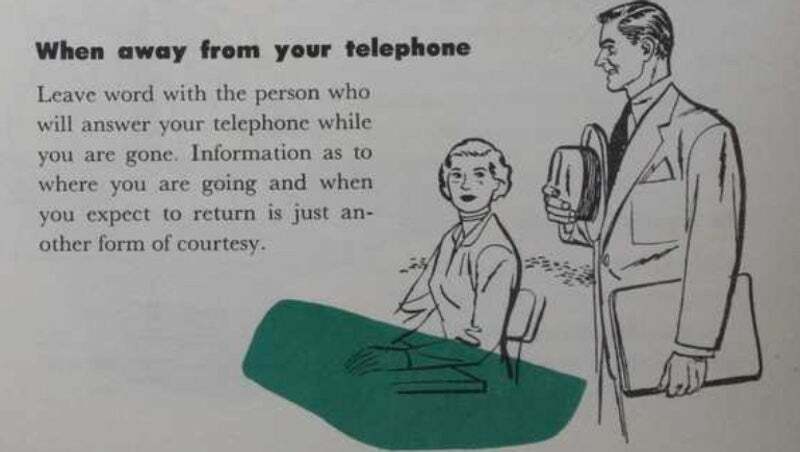 But most folks still know basic phone etiquette, like saying “hello” when you answer the phone, and not hanging up without some kind of goodbye. 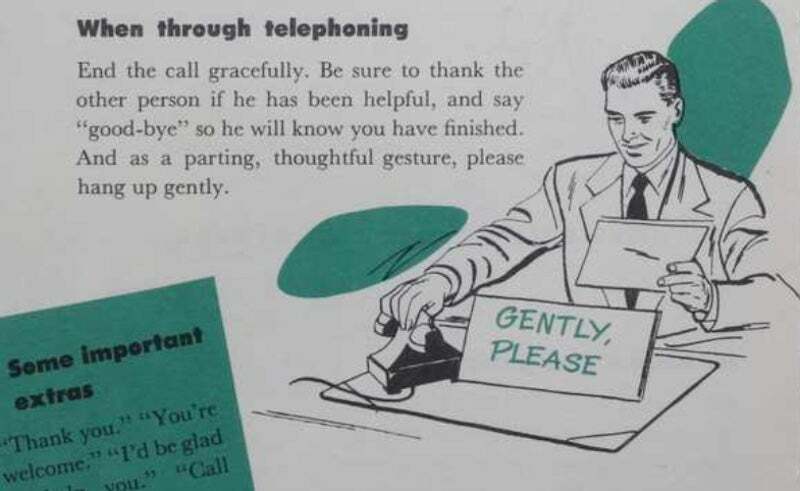 But in case you’ve forgotten, here’s a helpful guide from 1950 that was produced by a phone company—complete with some silly retro advice. The Hagley Library in the US state of Delaware has a digitised version of the 1950 etiquette guide that appears to have been targeted at businesses and was produced by Bell Systems. As John Overholt, a curator at Harvard’s Houghton Library points out, the booklet tells you to apologise when you’ve received a call from a wrong number. What other tips does it have? For one, it suggests you picture the person you’re talking to, even if you don’t have a videophone at your disposal. Which I guess makes sense if you’ve never used a phone before. 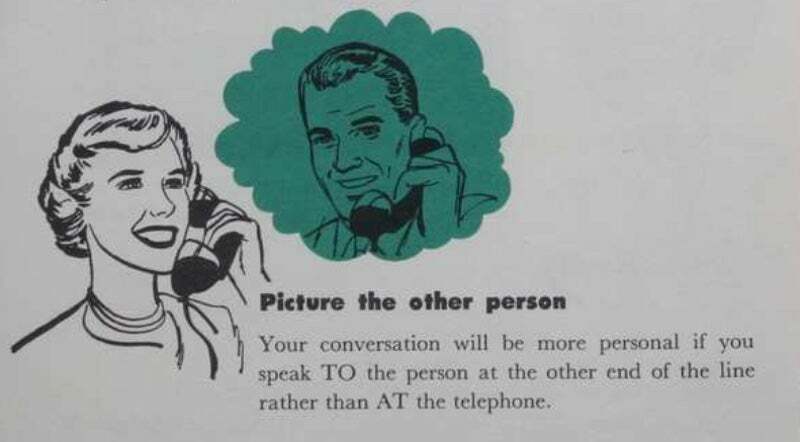 You’re not actually talking to the phone, you’re talking to the person on the other side of the phone. You’re also supposed to hang up the phone gently, something that kids today certainly aren’t familiar with. Let me tell you, slamming a phone down in anger was a pretty satisfying way to end a hate-filled phone call back in the day. Throwing your £1,000 smartphone onto your desk doesn’t have quite the same feeling and certainly has plenty of potential for destruction. The guide also explains that you should answer your calls promptly, not letting it ring too frequently before picking up the receiver. And in one of the strangest messages from the guide for kids today, people are encouraged to let others know where they’ll be when they leave the office. With smartphones in everyone’s pockets, it’s bizarre to think that there was an era when everyone wasn’t available at all times and in all places. People would have to tell others where they were going if they wanted to be in contact later. What a world.